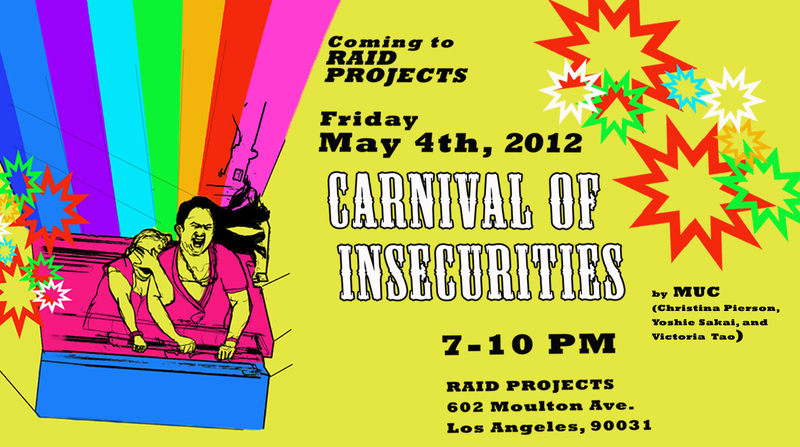 Next exhibition: MUC’s Carnival of Insecurities Friday, May 4th, 2012 7 to 10 p.m.
MUC will be unveiling its Carnival of Insecurities on Friday, May 4th 2012, from 7 to 10 p.m.at RAID Projects in Los Angeles. In this new performance and installation we explore the age-old mass appeal of the carnival; an exciting, stress-relieving, and somewhat dark event for anyone. Filled with twists on classic carnival entertainment, our version of a fun fair examines life’s expectations and the anxiety arising from them. MUC (Christina Pierson, Victoria Tao, and Yoshie Sakai) is an artist collaborative based in Los Angeles. We focus primarily on tackling societal issues through performance, installation, and video. We rarely say “no” to a new environment whether it be a Pilates studio, night club, art walk or gallery. We take a light-hearted and fun approach with a touch of absurdity aimed at giving relief to the pressures of modern life. MUC believes in the full experience of art for all art appreciators everywhere.